I saw a blur of pink against the shoreline’s brown sand and stared, not believing my eyes. A flamingo perched high on a pile of driftwood. It looked badly injured, the color drained from its feathers, its beak cracked, a gash ripped out of its back. I turned the boat and raced toward shore. It wasn’t just another bird, it was a flamingo, a Floridian like me, born in the tropics and lost in a northern land. A wave crashed over the cockpit as I jumped out. It swamped the boat and almost sent me tumbling into the surf, but I was too focused to care. The bird looked on the brink of death. It didn’t move as I picked it up and held it in my hands. I stared at it, worried it would fall apart between my fingers as I brushed away the dirt. Were you blown here form some tropical beach? Did you get disoriented in a storm and turn north? Did you escape from smugglers near the Canadian border? Is there an 60s Airstream camper parked on a Florida beach with an empty spot in its yard? It looked back at me, its eyes cold, almost lifeless, and said nothing. I placed it gently on the front of my boat and took off again hoping it wouldn’t fall as I paddled into the waves. 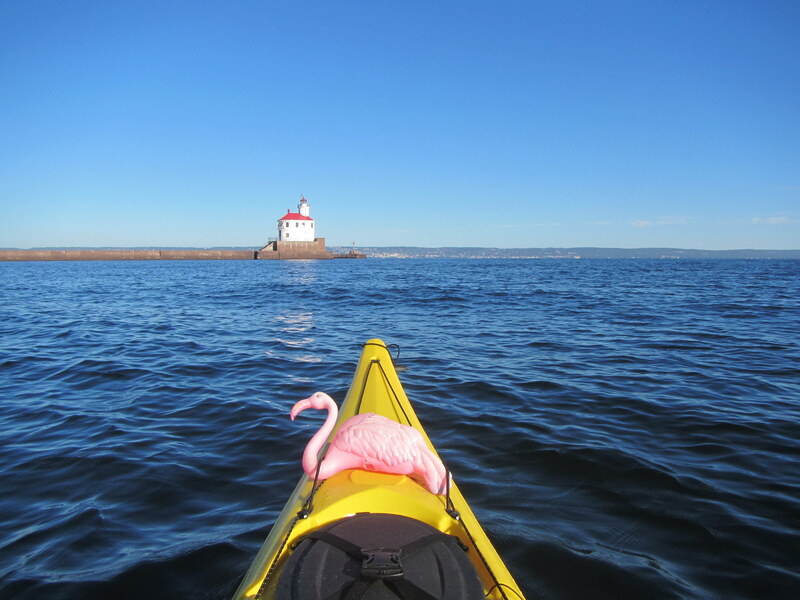 I looked at the bird’s pink feathers, bright against the Looksha’s yellow hull. Posted in Angle to Key WestTagged AKW September, Angle to Key West, bird rescue, flamingo, frank, pink flamingoBookmark the permalink. Frank wants to make it to Key West for New Year’s! Frank is singing that good ol Phil Collins song….take me home! Frank doesn’t remember! Still laughing. I have heard from others that Frank had a personality disorder,commonly referred to bi-polar flamingo-duck and that he thought he as an off-color mallard and wanted to spend the summer in the Great Lakes. I am pulling for Frank that he can recover as a recycled Canada Goose decoy. I’ve never hear of a flamingo in MN. Maybe this is a first. I’m sure it is grateful for your nurturing support. had to come from the zoo that was flooded out in duluth.